Power is rated at 485ps with an overboost button. 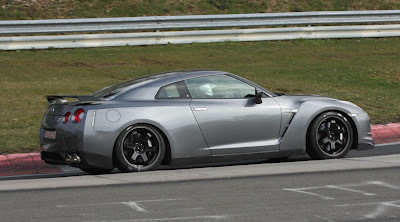 GT-R World says that it has 80 seconds of overboost, and then it needs to reset Maybe 80 seconds on, 80 seconds off. What exactly that means, we will find out a little clearer in the next few weeks. The biggest, and most significant change is the carbon ceramic brakes. These would contribute greatly to the overall weight reduction of(edit - 132 lbs - 1680kg-3703 lbs) 90kg (198 lbs). To replace the brakes, expect a cost of 4,000,000 yen or about $45,300 dollars. Yes thats right. $45,000 to do a brake job on the Spec V. The expected weight of the Spec V is 1637kg(3608 lbs), still no flyweight. Many of the parts that we first heard of and saw on the Nismo "Clubsport" GT-R are on the Spec V.
The titanium exhaust and diffuser. The suspension is 10-15 mm lower, and the suspension setting is fixed in the "R" mode. 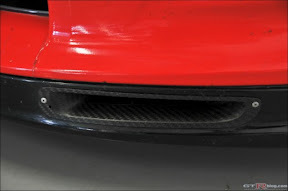 The front lip will have a carbon brake duct located in it. Volume is expected to be 30 units per month in Japan. The Spec V will only be available though 7 selected dealerships in Japan. The requirements for this vehicle are very high, which is why we should not expect to see this car in the United States. GT-R World quotes Tim Gallagher of Nissan North America, and says that the Spec V is not expected to be available in North America.